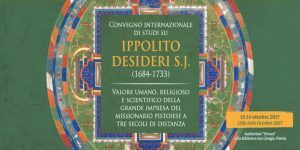 An two-day international symposium on famed Jesuit missionary to Tibet Ippolito Desideri (1648-1773) begins on October 13 in Pistoia, Desideri’s birthplace. The interdisciplinary conference is entitled, “The humane, religious, and scientific value of the Pistoian missionary’s great enterprise, three hundred years later.” It takes place at the Biblioteca San Giorgio. The program is available online and appears below. Thomas Cattoi, Ippolito Desideri and the Universality of Aristotelian Rationality: a Model or a Hindrance?